The book presents a concise introduction to the basic methods and strategies in fractional calculus which enables the reader to catch up with the state-of-the-art in this field and to participate and contribute in the development of this exciting research area. 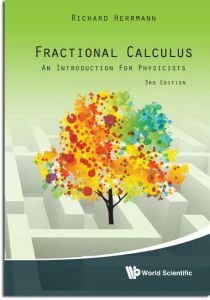 This book is devoted to the application of fractional calculus on physical problems. The fractional concept is applied to subjects in classical mechanics, image processing, folded potentials in cluster physics, infrared spectroscopy, group theory, quantum mechanics, nuclear physics, hadron spectroscopy up to quantum field theory and will surprise the reader with new intriguing insights. This new, extended edition includes additional chapters about numerical solution of the fractional Schrödinger equation, self-similarity and the geometric interpretation of non-isotropic fractional differential operators. Motivated by the positive response, new exercises with elaborated solutions are added, which significantly support a deeper understanding of the general aspects of the theory. Besides students as well as researchers in this field, this book will also be useful as a supporting medium for teachers teaching courses devoted to this subject. by Richard Herrmann, World Scientific Publishing, Singapore, September 2018, 636 pp, 6 x 9 in. amazon.com.au, amazon.com.br, amazon.ca, amazon.cn, amazon.com, amazon.co.uk, amazon.de, amazon.es, amazon.fr, amazon.in, amazon.it, amazon.jp, amazon.mx, amazon.nl, Barnes & Noble, BAM! (USA), Blackwell’s(UK), booktopia(AU), fishpond(AU), powell’s(USA), ….